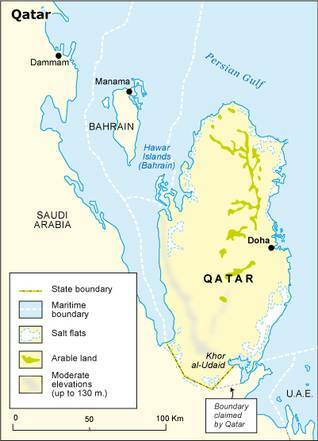 The small (sub)peninsula of Qatar is about 160 kilometres in length and between 55 and 90 kilometres in width. Its total land surface measures 11,437 square kilometres. Qatar’s coastline along the Persian Gulf is 563 kilometres long. The land border with Saudi Arabia in the south measures 60 kilometres. Qatar is geographically closely related to the United Arab Emirates (UAE) and Kuwait. Its interior consists of undulating desert plains and salt flats. In the south it reaches its highest point at the Qurayn Abu al-Bawl (Qurain Abul Bul), at 103 metres above sea level. The climate is hot and extremely humid in the summer. Summer temperatures average 35 °C, but 50 °C is not uncommon. In addition to the oppressive summer climate, frequent sandstorms and the hot northern wind (shamal) can also cause great inconvenience. Winters, lasting from the end of November until the beginning of February, are generally mild, with temperatures hovering between 10 and 25 °C. Modest rainfall of up to 20 millimetres a month, can be expected from December to April. 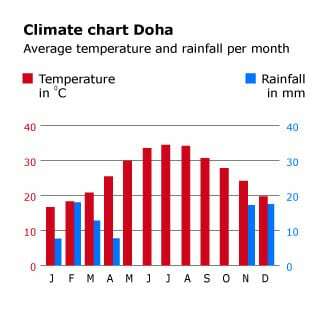 With an average annual rainfall of only 81 millimetres, Qatar is one of the driest countries on the planet. Wild trees are scarce, except for coconut and date palms and the odd acacia tree. However, during the colder months – when rainwater and dew collect in crevices and wadis (river beds) – parts of the inland plains blossom for a short period. Qatar’s wild mammals are hard to spot, most of them being small and nocturnal. 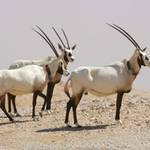 The larger, diurnal species, like the Arabian oryx, gazelle and ibex, have been hunted down to extinction. 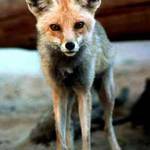 An exception is the Arabian red fox, which can be spotted during the (winter) day. 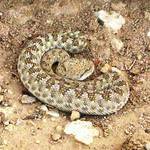 Snakes, like the dangers horned viper, and big monitor lizards feed on small rodents such as the lesser jerboa or ‘kangaroo mouse’, the jird and gerbil. The Arabian oryx, al-maha in Arabic, is Qatar’s national emblem. It was once believed to have been hunted down to extinction, but some herds have survived outside Qatar. Nowadays this gracious animal can be seen again locally – and not just on the tail fins of Qatar Airways’ planes. In the Maha Sanctuary in al-Shahaniya they are bred in protected herds, as part of an ambitious government plan to reintroduce the animals into the wild. Birds are much easier to sight, although the larger and tastier ones such as the Houbara Bustard and Arabian ostrich have suffered the same fate as the large mammals. Especially during the winter season the Gulf region abounds with migratory birds. They can be found wherever there is water and some vegetation, showing up at hotel swimming pools and the Doha Golf Club. The Gulf also has a rich marine life. 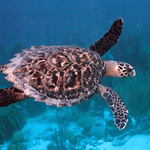 On the beaches north of al-Khor there are nesting sites of hawksbill and green turtles. Dolphins and porpoises can be seen off Qatar’s shores. The coral reefs attract a multitude of colourful fish as well as different species of shark. The government of Qatar has ratified multiple international agreements on natural conservation, but industrial, urban and touristic development continue to threaten biodiversity. 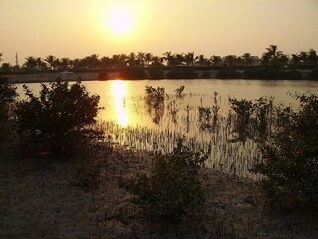 As a result, while the nesting grounds of the endangered green turtles near al-Khor (or Kohr, al-Khawr) are patrolled and the mangroves of the north are partly being replanted, the mangroves near al-Wakra – sustaining a wealth of flora, birds and marine life – are being cleared for urban development. There are no official nature reserves in Qatar, although there are plans to turn the so-called Inland Sea, Khor al-Udaid, into a protected conservation area. It is about 60 kilometres south of Doha and an important area for resident and migratory bird species, such as flamingos, cormorants, waders, gulls and terns. 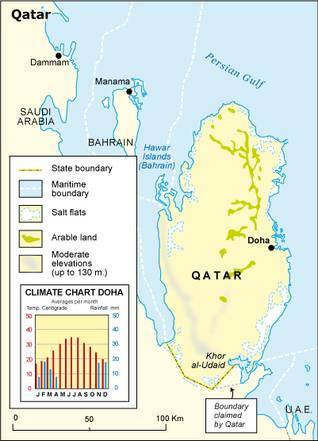 A mere 1.64 percent of Qatar’s surface consists of arable land, and 0.27 percent is cultivated with permanent crops. All agricultural land is owned by the government. Barley, maize, vegetables, melons and dates are produced. In addition, cows, camels, goats, sheep, and chickens are bred for milk, meat and eggs. The sea is a major additional natural resource. Qatar’s nationalized fishing fleet registered a catch of almost 14,000 tons in 2005. 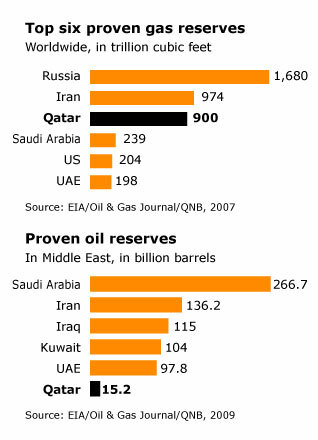 But most important are Qatar’s proven natural gas and oil reserves. The proven gas reserves are about 900 trillion cubic feet, 13.7 percent of the world total and the equivalent of 162 billion barrels of oil. This is sufficient to support the planned production for over 200 years. Qatar’s proven oil reserves are 33 billion barrels (including condensates) and should ensure a continued output at current levels for the next 90 years (EU Energy Country File). Other mined geological resources are sulphur, limestone and gravel.